A walk-through of the 5-day water fast with the tracked results (ketones, glucose, weight) and the practical do’s and don’ts to make the most of the experience. I’m not a fan of cancer. The only people I’ve lost in memory – my grandfather and other close family – it was cancer that took them. NOT putting an end to the fun of life because of cancer has been a part of my plan since my early 20s. So after my discussion with Dr. Thomas Seyfried in episode 16 I was looking forward to put his 5 day water fast “cancer insurance policy” to work. As I read into the details to start planning my prolonged fast what I found convinced me even more this was something I had to do soon. Maybe what I discovered would inspire you to try a 5 day fast soon too? Since getting bitten by a tick in Phuket, Thailand a few years ago I’ve been fighting some chronic health issues. I discovered that it’s probable that these are at least in some part due to lyme disease and babesiosis infections I only got documented earlier this year (and thus had never been treated for). It bears mentioning, since there’s a fair amount of non-rigorous and dubious material on the internet on the subject of lyme disease in particular, that this was documented via the IgM/ IgG labs, and met CDC criteria. What does this have to do with fasting? It comes down to this: Having a stronger immune system gives you a better chance of eliminating lyme. Since in cases like mine where it was not treated in the early stages it seems to be relatively tricky and long-winded to get rid of. I’ve made it a rule to collect and put into practice anything that improves the odds of a quicker recovery. And… fasting is a potential new tool to speed up recovery. Valter Longo, Director of the USC Longevity Institute, has published a large number of studies on fasting and caloric restriction and their application to treat disease and enhance aging and longevity. Some of his recent work showed that prolonged fasts (e.g. 3 to 5 days, of a similar format recommended by Seyfried) can regenerate up to 30% of the immune system. Or in other words, a fast can eliminate old tired (and most probably damaged and dysfunctional) white blood cells and replace them with more effective shining new ones. I’ll admit this got me excited. It was definitely something I wanted to add into the “war plan” my integrative doctor and I had put in place against lyme and babesiosis. As you’ll see below, the 5 day water fast (and other prolonged fasting configurations) has many potential upsides. After having gone through the experience and seeing the quantified results, I can say it’s something I will use as a tool frequently going forward. Most likely once per month, or once per quarter. Beyond the potential health and longevity upsides there were also a couple of others I was particularly interested in. Building greater mental resilience through the process of overcoming the challenge of a fast? The stoics used hard life experiences to learn to deal with the mental ups and downs of life more easily. As an entrepreneur, where ups and downs are pretty much routine, I’ve grown to value this ability immensely. Exposing yourself to more extreme hard challenges numbs you to the emotional pain and you find you become more indifferent to life’s ups and downs (read less reactive). You can read up on this in the book The Obstacle is the Way by Ryan Holiday (which I must have listened to 8+ times), or articles on the philosophy of stoicism on Tim Ferriss’ blog. A 5 day fast struck me as exactly the type of “safe but challenging experience” that builds mental resilience more generally. Once the fast is done, you realize it’s absolutely not a big deal. And other life challenges also seem to dim in their intensity and importance. 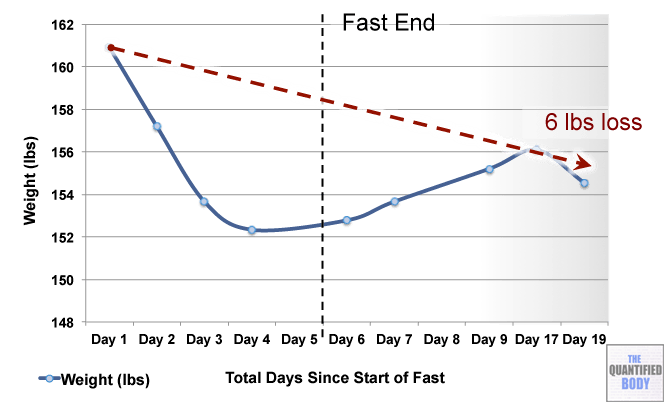 A new life experience: What would it feel like to fast for 5 days? How would it effect my body? physically? mentally? We should all experience the extremes of the human experience provided they are within the limits of safety and healthy. It’s an important tool to learn about ourselves, our limitations, strengths and weakneesses – self awareness is a skill that can be learned. Going to the extremes to get a real feel for the breadth of life is part of living a life well lived. 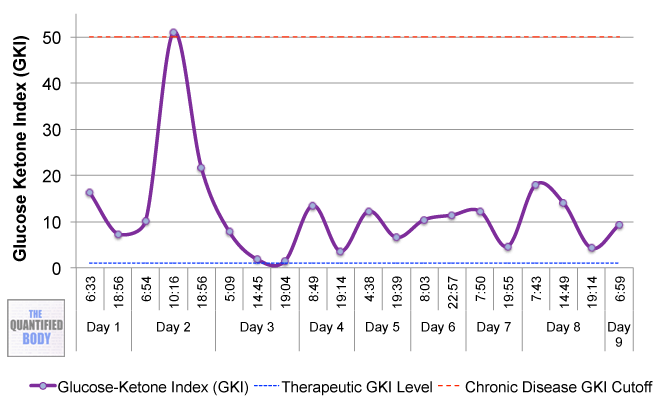 My metabolism switched from glucose to ketones (and fatty acids) by the end of the 3rd day, which fits with what is generally expected based on the standard biochemistry literature. On typical non-fasting days I’ll hit between 1 and 2 mmol/L ketones (see my baseline data in appendix here) because I eat a reasonably high fat diet. It wasn’t till day 3 till I broke the 2 mmol/L threshold and went beyond, eventually peaking at nearly 7 mmol/L blood ketones. At the same time my blood glucose hit a stable low of just under 60mg/dL. Overall, I felt less mentally sharp and found the fast hardest between the end of day 1 till around beginning of day 3. Is this ‘harder part’ of the fast a rough period of adaptation to using ketone and fatty acids as the main fuel source? Perhaps. In my case the switch in the blood results follows closely the ease of the experience for me – once blood ketones and glucose inverted the experience was easier. Seyfried recommends the use of a Glucose-Ketone Index for monitoring the therapeutic value of the fast against cancer. The goal is to have your value of this index below 1 which is considered the ‘therapeutic zone’. 67 hours into the fast my index dove below 1, and it bottomed out around 90 hours, from then on hovering between 0.5 to 0.6. So I was in the therapeutic zone for all of days 4 and 5. 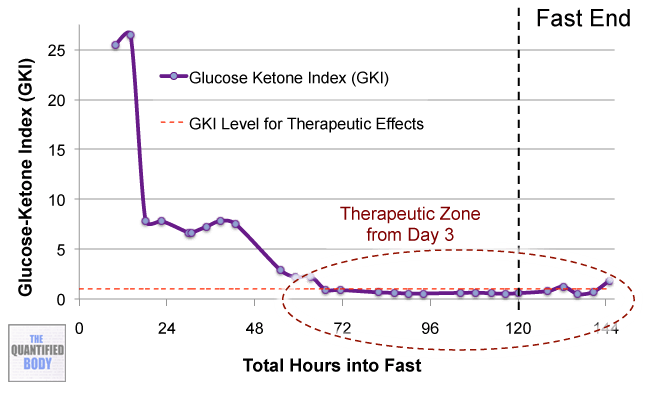 Exactly on plan: My blood glucose, ketone and GKIC markers settled into the expected ranges Seyfried outlines in his book for the fast. That’s between 50 to 60mg/dL for blood glucose, and between 6 and 7 mmol/L for ketones. When I hit the 120 hour (end of 5 day) mark I dug into a couple of big bowls of bone broth. Quickly full and satisfied seemingly as if the fast had never taken place. The next day I had a higher carb than usual breakfast. We’re not talking crazy, just some blueberries and yacon syrup (for the gut, will talk about this soon in another episode) with bulletproof coffee (ghee, MCT oil and coffee). Despite this my ketones stayed high and actually hit their peak of the whole experiment (6.8 mmol/L) nearly 24 hours after the fast had ended. This makes sense. 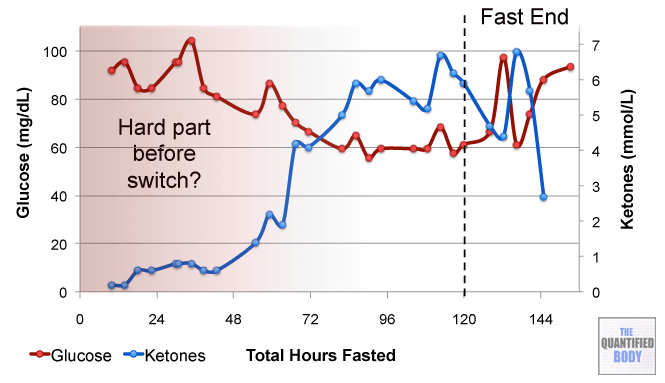 It’s normal to see a lag of response of the blood readings the first 3 days of the fast while you adapt to ketones/ fatty acid metabolism. So it follows that there would be a lag in the switch back to primarily glucose metabolism. Was Weight Loss Permanent? or Just Momentary? Interested in the fast to lose weight also? Cycling into 5 day fasts say once per month, could be quite effect based on my data (~loss of 1 lb per day in terms of permanent weight loss, not just momentary during the fast). If weight loss isn’t desirable, which is my case, you’ll need to compensate to regain lost muscle weight post fast. Within a few days I had recovered one third (3 lbs) of the 9 lbs I’d lost during the fast. I consciously made an effort to eat as per usual to see if it the weight would naturally come back on. Two weeks later after the end of the fast (day 19) it’s still stabilized at 6 lbs down. Actively compensating for this in between future fasts will require consciously eating to gain weight. I also tracked my HRV with the ithlete app, my daily meditation sessions with the Muse Calm and my mental performance via reaction tests at Quantifed Mind. These weren’t my main focus for this fast, so the data isn’t extensive enough to make any big conclusions. However, looking at what I collected, I plan to take a closer look at mental performance and HRV in future fasts. First thing in the morning HRV dipped at the start of the fast (day 1 and 2) and go back to my normal range from then on. This is a pretty good fit with how I felt during the fast. The first two days were a little rough as I had a headache, but from then on I felt more ‘euphoric’ and productive than usual. This time round I haven’t seen any noticeable increase in HRV post-fast (potentially a bit more of the opposite) whereas intermittent fasting typically raises HRV. Something to keep an eye on for future fasts especially as I have to deal with my own personal variable – adrenal fatigue. Adrenal Fatigue Confounder? I have documented adrenal fatigue currently (low cortisol output as a knock on effect of the chronic stress from lyme disease and babesiosis infections). I suspect the adrenal fatigue would be the cause of any negative HRV impact, and would be personal to me (if you’ve tracked HRV during a fast let me know your experience in the comments). This may have been behind or contributed to my less consistent sleep and shorter duration sleep as noted before. It is very common (even fashionable) to fast on meditation retreats. The idea the retreats promote is that fasting helps to calm the mind. Although I got my best Muse Calm score to date on one morning (80% calm), I didn’t notice any real difference between fasting and my normal scores. Two of my fellow entrepreneur buddies (Patrick Stiles and Patrick Kelly (@pjkmedia)) recently also did the 5 day water fast so we caught up to share notes on our experiences. Our experiences turned out to be pretty different in some areas. You can listen to our full note swapping discussion in this episode. On day 4 and 5 the physical weakness was a lot more noticeable and there was some slight dizzyness when standing up at times. Undercover bad breath: I wasn’t actually aware of this during the fast. My sister mentioned afterwards that she feared for her 1 year old son’s wellbeing when I was playing up close with him towards the end of the fast. Given the high ketone levels, this would mostly be due to high acetone levels in the breath. Rash of spots on chest: I believe this is very much personal to me and my current situation. Fasting tends to lead to detoxification, and potentially stress your detoxification system, as you break down body fat including accumulated fat-soluble toxins and process them. While dealing with lyme these have occurred from time to time (added lyme biotoxin burden causing overload), so it’s unsurprising that adding broken down fat-soluble toxins would lead to this currently. I took activated charcoal daily to help bind and clear any toxins from my system. After a couple of nights of good sleep at beginning of the fast it got progressively less deep as the fast went on whereby I was sleeping between 4 and 6 hours compared to a normal 6.5 to 7.5. What’s Next? Fasting as a Routine Tool. The experience during and after the fast has been so positive that I’m planning to do this on a once per month or once per quarter basis. Which one I go with will depend on how my body responds. As more research comes out on the specifics of Fast Mimicking Diets (FMDs) I’ll also want to test that out, to see if the same benefits can be achieved (or better) with less discomfort. Immune System Reboot – Any Evidence? It’s only 2 weeks since the end of the fast so it’s early to tell just through tracking symptoms of my chronic infections (lyme, babesiosis). Nonetheless it’s looking positive from that anecdotal basis. After a first rough work post-fast, it’s been up and up. Meaning more exercise, more activity and generally feeling better with less symptoms. Further validating the immune system reboot side by tracking IGF-1 which is one of the main markers used in Longo’s paper. Is this sustainable for me? Is it beneficial as a monthly routine or would that have some negative blowback? I’m looking into tracking Cortisol vis-a-vis monitoring my adrenal fatigue status, and will track weight with future fasts. What’s the downside in terms of productivity for the 5 days fasted? While I didn’t feel like there was much negative impact this time (it felt more positive) it’s something that I’d like to confirm with some short mental performance tests done during next fasting round. For my tracking I took readings 4 times per day for my blood glucose and ketones. However, I recommend to reduce cost (ketone strips are expensive) and to make it more convenient, you can simply track your blood ketones and glucose once per day in the morning. This will give you meaningful results, and tell you if you’re hitting the same milestones based on Seyfried’s work like I did. Tracking this way, for a ten day tracking (5 days as control, 5 days of fast) you’ll be looking at a budget of around $80 to $100 all in (versus the ~$500 I spent). Combined glucose/ ketone monitor: Abbott is behind the best value for money units, the Precision Xtra Blood Glucose and Ketone Monitoring System in the U.S. and the Freestyle Optium Neo Glucose & Ketone meter in the UK (the one I used). 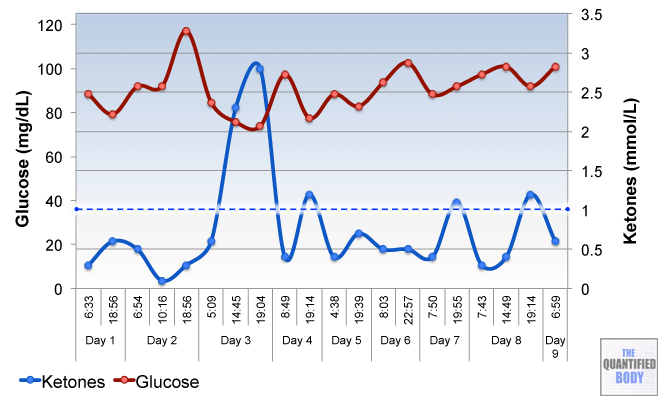 Glucose strips: the latest format that work with Precision Xtra and Freestyle Optium devices. Lancets: It’s good practice to use a new lancet each day to prick your finger with. These Lancets are the latest format and work with Precision Xtra and Freestyle Optium devices, but are cheaper. Note: Make sure to buy adequate strip and lancet supplies. I ran out of ketone strips the day after my fast otherwise I would’ve tracked more post-fast data. You lose some strips unavoidably in my experience through a bad reading on the device where for instance you didn’t provide insufficient blood. Make sure to have a buffer of 10% or so to account for this. This is one of those situations where a video walkthrough is better than 1000s of words. This walkthrough is with the Freestyle Optium Neo, which is identical in use to the Precision Xtra). I used my control data week (charts in appendix here) to work through any slip ups in taking readings. You’ll want to get some control days where you take some baseline data eating your standard diet so that you can compare it to your fast. Blood sugar and ketosis metabolism are very personal aspects of our biology as we learned from Jimmy Moore in episode 7. So the relative change in your measurements (normal diet, fasted states) could be as insightful as the absolute numbers. The experience of a fast is highly variable depending on your personal situation as you’ll have noticed from the discussion in this episode with the two Patricks. There is a risk that you’ll feel pretty rough and weak, and may be a danger to yourself and others (e.g. no driving or other similar ‘responsible’ activities please). So I recommend you plan ahead and schedule it in for a time when you can quietly do some mental type work, study or rest at home. If you’re able to do more, so much the better, but plan for not being able to do anything. Pretty straightforward. Stop eating at your scheduled time (after an evening meal is when most people do it) and start taking readings as set time intervals. I used a standard iPhone timer alarm to notify me to take readings every 4 hours while awake. If you’re just taking one reading per day, it’s simple enough to make it part of your first thing in the morning routine. It’s also useful to keep a diary of anything interesting or unusual you notice during the fast. Items I found useful to note down were hours sleep and sleep quality, physical weakness, any fatigue, mood, and other symptoms like headaches or dizzyness. This way you can relate them back to the data afterwards for more insights. Boom, you’re done! You’ll be feeling great if it was anything like my fast. There are a few things you may want to keep in mind at this point. I was advised by friends, and some long term ‘fasting experimenters’ to reintroduce food slowly. The idea behind this is that your body needs a little time to restart enzyme and stomach acid production. Some people experience gut symptoms or/ and bouts of ‘disaster pants’ if they jump straight back into their usual diet (or a ravenous version of this). In my case, I prepared a bone broth ahead of time so that my first meal was mostly liquid and ate as normal from the next meal onwards. No discomfort or adverse gut symptoms. Straight back to business as usual as if the fast had never happened. In future I’ll be tracking data for a few days post-fast since this experiment showed that my metabolism took a while to return to normal despite refeeding with a vengence! Damien’s Routine Tracking Devices : Some of Damien’s daily use apps featured in this experiment including the Muse Calm for meditation, the iThlete Pro app for HRV, and Quantified Mind for mental performance. Healbe GoBe: Damien mentioned that he’s been testing this device, and that the tracking of hours slept works quite well – but that other functions of the device make it hard to use consistently. uBiome: Damien mentioned as a side note on another experiment he’s working on to shift his whole biome to a more positive balance of bacteria. Functional Adrenal Stress Profile (BioHealth): Mentioned by Damien in relation to testing for adrenal fatigue. 3 to 5 day Water Fast: The fast featured in this episode. Recommended by Dr. Seyfried as a potential tactic against cancer (reduce risk, or fight cancer disease). More details in Seyfried’s interview. Also used to promote stem cell regeneration of the immune system as per Valter Longo’s work. These fasts are often referred to as Prolonged Fasts in the literature. Ketogenic Diet: The term given to low carb-high fat diets that put your metabolism into a state of ketosis (using ketones for fuel). Damien’s day to day diet shown in the baseline results is at times ketogenic. Fast Mimicking Diet (FMD): FMDs have been covered increasingly in the research and there are two papers covering human clinical trials expected to be published on them in 2015 by Valter Longo’s group. With the FMD you fast 5 days each month by restricting certain proteins and keeping calories below a specific range each day. The goal is to reduce fasting discomfort and downsides while accessing the same upsides as the fast. Intermittent Fasting: A form of fasting where you fast for part of or full days. The most popular formats are using eating windows of 4 to 8 hours each day. Bob Troia discussed his results from intermittent fasting in episode 22. Slow Carb Diet: Patrick 1 mentioned that he’s primarily on this diet from Ferriss’ The 4-Hour Body. Activated Charcoal: The only thing I did beyond restricting myself to filtered water and black coffee (total of 3 cups in whole fast), was to take activated charcoal once a day to aid in clearing toxins from my system. I took a handful, around 8 to 10 capsules per day. Brain Octane: Damien takes brain octane every morning in coffee to help raise his ketones. Immune system renewal study June 2014 and USC press release. Troy Angrignon: Troy tests and analyses the wearable devices for fitness, he appeared in episode 24. The 4-Hour Body: Contains a once per week intermittent fasting format that got Damien started with fasting in 2010.